Product prices and availability are accurate as of 2019-04-06 09:13:07 EDT and are subject to change. Any price and availability information displayed on http://www.amazon.com/ at the time of purchase will apply to the purchase of this product. This locknut is a class 125 brass pipe fitting with female National Pipe Taper (NPT) threads for locking two male threaded fittings or pipes for stability and reduced vibrations. 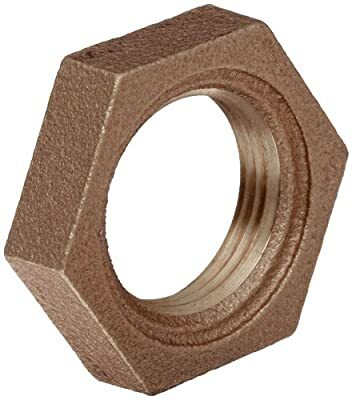 The locknut has NPT threads for creating a tighter seal than straight threads and a hexagonal shape for increased leverage and use with a wrench during installation and disassembly. It is made of brass, which has greater corrosion resistance than steel, and the material’s relative softness allows for easy installation. This class 125 locknut meets standards ANSI B 1.20.1 and ANSI B 16.15 for quality assurance. Class is a standard relating to tolerance, construction, dimension, and wall thickness, but it is not a direct measurement of maximum working pressure.